The Westminster Cathedral Choir take a wall-of-sound approach to Palestrina. They field around 40 singers and the microphones are set well back in order to homogenise the sound and take advantage of the Cathedral’s long yet magnificently even reverberation. Unfortunately, this recording fails to be more than the sum of these impressive parts. Listening to the two Palestrina masses, you really get the feeling that this music is bread and butter to the singers, core repertoire that they perform on a very regular basis. But has complacency crept in? The intonation and passage work are often approximate at best. The boys are more to blame than the men, I think, although every voice group has their moments. Or perhaps I just don’t share the choir’s artistic values. The recording conforms to a solid tradition of liturgical singing, where bigger is better and the superiority of boy’s voices in the upper parts is unquestioned. These days CD buyers have a wide choice, although plenty remain loyal to Martin Baker and his cathedral forces. Precision is always going to be at a premium with a choir of this size, just as clarity is going to diminish with the homogenisation of the recorded sound. But even so, this is music that relies on the contrapuntal interplay of voices for its structure and progression. One advantage of the choir’s liturgical context is the emphasis they place on the articulation of the words. This is a value they share with Palestrina himself, and in the quieter openings in particular, the music is carried through the sheer power of diction. Credit too for the choir’s stamina, the musical problems I mentioned do not increase as movements progress. And what fascinating repertoire. The two masses, Missa Te Deum laudamus and Missa Tu es Petrus (the latter the justification for the Rubens on the cover) are Palestrina at his level best. The former is set in the Phrygian mode, giving a plaintive shading even to the most opulent passages. 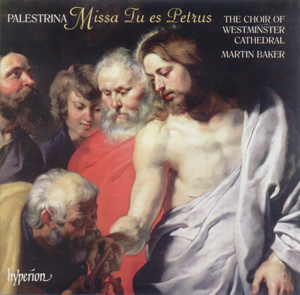 Missa Tue es Petrus was only published in 1887, a victim, perhaps of the quantity of Palestrina’s output. It is a parody mass based on the composer’s motet of the same name, which is also included. A four voice Te Deum by Victoria opens the programme. It is rhythmically more interesting than the Palestrina that follows, more structurally varied too, alternating plainchant with homophonic choral writing. By avoiding Victoria’s polyphonic works (many of which, of course, are magnificent), the disc does him the favour of not setting him in direct comparison with Palestrina. He would struggle to win that one. All in all, though, this disc is a disappointment. It is strictly for those who have a preference for large choirs, boys’ voices, opulent acoustics, slow tempi...dare I say it, old fashioned Palestrina. But even they are likely to be disappointed by the intonation and many moments of weakness in the upper lines. The Westminster Cathedral Choir is one of this country’s great musical institutions, and their recording catalogue includes many, many recordings that are better than this one.